The raccoon is an animal which is very clever but also very mischievous, outsmarting many animals giving it the success rate they have in the wild. This raccoon in Parc Omega in Montebello, Outaouais in Quebec, gives visitors a cute picture as he looks out the window of a tree house. The tree house gives the raccoon somewhere to hide, play and sleep without being harassed or interrupted by any of the larger animals found throughout Parc Omega. As the raccoon shows his head through the tree house window, one can see the mask around its eyes which makes it look like a bandit. Above the black markings, the white fur near its eyes and on its nose, contrasts the black mask. Long whiskers extend from either side of its nose as its slightly rounded ears stand upright on top of its head. 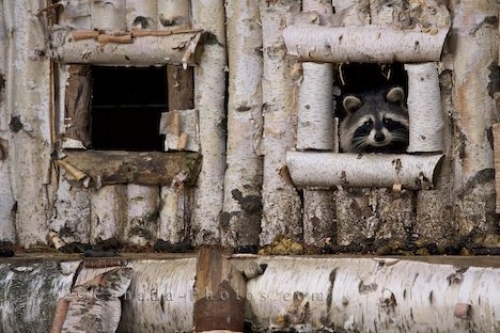 Picture of a cute raccoon as he peeks out the window on a tree house in Parc Omega in Outaouais, Quebec in Canada. Many find the raccoon to be a cute animal until they have dealings with them when they raid garbage and make loud growling noises. They can be a viscous type of animal if cornered or feel like they are threatened in any way. In Parc Omega in Outaouais, Quebec, there are plenty of raccoons, some which venture extremely close to the car and visitors should be on the look out for any crossing the road in front of them. Raccoon, Procyon lotor, in a tree house at Parc Omega in Montebello, Outaouais, Quebec, Canada.